I am in my second year studying English Literature. Poetry is one of my biggest passions and I enjoy writing (and occasionally performing) my own poetry, as well as attending spoken word nights and watching exciting new poets perform. I love studying in London because, unlike in my hometown Portsmouth, there is always something interesting going on and there are a range of brilliant galleries, museums and markets to visit. I am a columnist for the student-run CUB Magazine and write about Obsessive Compulsive Disorder, as mental health is an important issue to me. One day I would like to help tackle the stigma attached to mental health problems on a greater scale. Book lovers everywhere, rejoice! To celebrate Penguin’s 80th anniversary, the publishing house has launched a Little Black Classics range. You may have seen the promotional posters on the Underground, which, I have to say, have made rush hour much more bearable. Each simple poster includes a quote from a text, which remains unnamed, prompting a delightful game of ‘Guess the Book’ as you’re swept along the platform with the disgruntled 5pm crowds. Even more exciting is the price of the Little Black Classics – they’re only 80p each! A glorious bargain. I can just hear the grateful roars of Literature enthusiasts everywhere. Where can you get your hands on these sumptuous gems? Foyles in Charing Cross Road, the Chocolate Factory of the book world – and we all hold a golden ticket! I certainly felt like Augustus Gloop when I trekked there earlier today. The Little Classics are displayed along all of the shop’s staircases, so up I climbed, elbowing my way past bemused customers and gorging myself on these delicious offerings. I picked up Anthem for Doomed Youth by Wilfred Owen, Woman Much Missed by Thomas Hardy, The Eve of St Agnes by John Keats and Goblin Market by Christina Rossetti. At 80p a pop it was like daylight robbery! Other titles up for grabs include It Was Snowing Butterflies by Charles Darwin, Circe and the Cyclops by Homer and Lord Arthur Savile’s Crime by Oscar Wilde, among many others. What is also so great about this range is that it is taken from Penguin’s Wider Classics, so you get to sample some perhaps more obscure texts by some of our best-loved authors, and broaden your knowledge of their work. Also, on a purely aesthetic level, their simple black and white design is slick and classy, they can easily slip into a handbag and they are, like, so cute. To check out the range for yourself, just go to www.littleblackclassics.com. Today I finally made it to the Sherlock Holmes exhibition at the Museum of London, which is embarrassingly late considering it has been running since October. Clutching my ticket, I descended the stairs to find a father and two kids patting a bookshelf in front of me and, catching my puzzled expression, the security guard informed me that we had to find the entrance. The father finally had some luck and pushed the right book, which, to the excited squeals of his two children, revealed a doorway. A charmingly magical entrance to an exhibition about a rather magical genius. As the title of the exhibition suggests, the emphasis is on the timelessness of Sir Arthur Conan Doyle’s creation, the endless possibilities for adaptation and the way in which the Sherlock Holmes stories capture the imagination, ensuring their remarkable staying power in our hearts, on our bookshelves and on our televisions. This message is clear from the very beginning, as, on entering, you are confronted with several television screens, each displaying a different adaptation of Sherlock Holmes through the years. From Alan Wheatley’s portrayal of the detective in the 1951 BBC television series, to Guy Ritchie’s 2009 film version and Benedict Cumberbatch’s adoption of the role in 2010, it is clear that the adventures of Sherlock Holmes will live to deliver and delight time and time again. The meticulous detail that has clearly been put into this exhibition is impressive. Much like the detective himself, it leaves us with no stone unturned, every aspect of the author and his creation are presented and examined – there is even a section dedicated to London fog, as this features frequently in the stories. I personally liked the maps of Victorian London, which were fascinating. One map was colour coded to show the areas of London that were ‘wealthy’, ‘well to do’, ‘poor’, ‘very poor’ and so on. There were also maps dedicated to certain stories such as ‘The Hound of the Baskervilles’ and ‘A Study in Scarlet’ to show the areas of London that Sherlock and Dr Watson had visited in these tales and which mode of transport they had used. This visual representation of the stories is great as it makes us connect with them even more, seeing if Holmes ever passed by the way you walk to work, or if he and Dr Watson ever visited your neck of the woods. You get to immerse yourself even further in the world of Holmes and watch the scenes of pursuit unfold in front of your eyes. Another great feature was a display of postcards sent to and from Sir Arthur Conan Doyle. We are asked to adopt the role of the detective as we are told that one of the postcards holds some significance to the Sherlock Holmes stories and are given the clue to look at the picture on the postcard and its address. This interactive element encapsulates the spirit of Holmes and further engages us with the detective and his creator. Indeed, in the final section of the exhibition we are presented with various artefacts, such as a pair of ladies’ shoes which are shown to have slits in the soles where a blade would have been kept. It is the presentation of such minute details that allows us to get inside the mind of the detective and imagine Holmes examining such items himself in order to solve mysteries. The exhibition completely engulfs us, transporting us to the world of Sherlock Holmes in a way that is magical and that indeed proves that the much-loved detective will never die. If you haven’t already been, there’s still time to catch the exhibition as it is running until the 12th April and costs £9 for students. Worth checking out if you’re a Sherlock Holmes fan, and there’s a charming little café next door that sells an excellent Lemon Drizzle. Mary Berry would be proud. As part of our Victorian Fictions module, we had a visit in Week 10 instead of attending a lecture. We were given lots of interesting options, such as the Dickens Museum, the John Soane’s Museum, the Museum of Childhood and the V & A Museum. 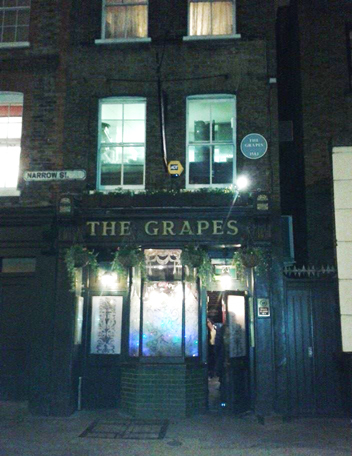 However, naturally, I chose to go to a pub in Limehouse called ‘The Grapes’, which is owned by none other than Sir Ian McKellen. I read Dickens’ excerpt after I visited the pub, and I believe that he captures perfectly the rather precarious-looking stance of the public house as it seems as though it could topple into the river at any moment. As you can see from the rather blurry photograph taken by myself, the pub is quite small, but expands upwards rather than outwards, likening it to the TARDIS as it is actually slightly bigger on the inside, with an upstairs restaurant. We were unfortunately too late to order food, which smelled delicious and looked amazing as I gazed greedily at other people’s plates. So I would definitely recommend having dinner if you visit this pub. We visited at the best time of the year and at the best time of the evening. There is simply nothing better than walking through a dark, cold street, breath billowing out before you, hands raw and numb with frost, to then take refuge in a warm, cosy pub lit by a real fire. 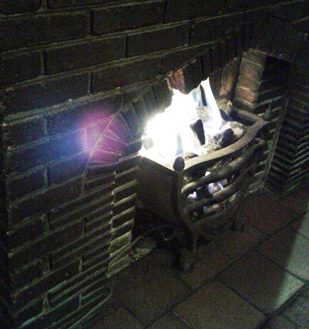 I mean, when was the last time you saw an actual fire in a pub? Perhaps we’re just deprived of pub fires in my home town (and, incidentally, Dickens’ city of birth) Portsmouth, but it was seriously exciting. And satisfyingly toasty. Evidently proud of the pub’s Dickens connection, the owners have decorated the walls with pictures of Dickens’ most famous characters such as Bill Sikes and the Artful Dodger from Oliver Twist and Captain Cuttle from Dombey and Son. There were copies of Dickens’ greatest novels on the bookshelf, giving a welcoming and homely atmosphere and prompting greater enthusiasm in all Dickens fanatics. This pub is definitely worth a visit. 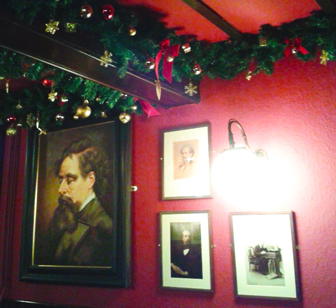 Even if you don’t like Dickens, its cosy ambience and reasonably-priced drinks make it student friendly and welcoming. It is also rather quirky and perhaps not somewhere you would usually visit as it is a bit off the beaten track, so it’s always good to check out new and different places. If it’s good enough for Gandalf, it’s good enough for me! Poetry, poetry, poetry. I love poetry. I like putting on a silly voice to impersonate T. S. Eliot whilst reciting ‘The Lovesong of J. Alfred Prufrock’ and deepening my voice to imitate Dylan Thomas’ melodic reading of ‘Fern Hill’. That’s just how I spend my Friday nights. I particularly enjoy spoken word poetry and I remember the first time that I encountered it. I was in my A-Level English Literature class and, in preparation for the practical criticism section of our exam, my teacher asked us all to teach a lesson on a poem of our choice. A guy in my class called Ben brought in an intriguing poem called ‘A Letter from God to Man’ by the spoken word artist Scroobius Pip. Fireworks erupted in my head, creating little circles of dancing light and all my nerves were fizzling. I liked it a lot. I proceeded to search for this mysterious Pip figure on YouTube, watching his videos to much more crackling and sizzling throughout my body. From this, I found Kate Tempest. Watching her perform makes every hair stand on end, her passion, her masterful command of rhythm and the raw, gutsy subject matter of her poems makes me want to scream ‘YES!! !’ Poetry is beautiful. And this intense love was only to grow more and more passionate during my first year at Queen Mary. One lecture that particularly stood out was that entitled ‘The Line’. This was one of the first lectures on the module and it was memorable because Katy Price made us rip up a poem and rearrange it to see how line structure and length can affect a reading of a poem, its meaning or its overall effect. It made me realise just how creative you can get when analysing poetry and the extent to which you can deconstruct it: nothing should be taken for granted. I found this particularly interesting, especially the emphasis on sound within poetry and how it should be read aloud in order to gain a better understanding of it. This, of course, had been taught at A-Level, but the teaching at Queen Mary made poetry seem much more accessible and dynamic. The use of videos and music to illustrate points about rhythm and sound were particularly useful (Peter Howarth also used the music video for ‘Girlfriend in a Coma’ by The Smiths to assist his explanation of irony, which was another highlight). The enthusiasm with which the lectures were delivered and the fresh and innovative way in which poetry was presented helped to nurture my passion for it and confirmed my undying love for it. My personal highlight from the entire first year was the Poetry Performance week. When I first heard that in Week 8 we would have to do a ‘performance’ I was bricking it. I hate doing presentations and speaking in front of lots of people, so the thought of having to actually perform made my blood pressure sky high. Week 7 came. It was time to plan my performance. It had been explained that we didn’t actually have to do a performance in which we stood up in front of people and recited a poem, we could do anything creative that showed our interpretation of the poem, such as make a video or a voice recording of the poem. However, in a sleep-deprived moment of panic and utter madness I decided to perform ‘Daddy’ by Sylvia Plath. But I came to the conclusion that a simple performance was not enough. I decided to make awful collages which were supposed to represent certain key phrases or ideas within the poem and I intended them to look child-like to link with the poem’s theme (and to disguise the fact that I am really not artistic). Once I arrived at the seminar, most of my fear had disappeared. Everyone was really supportive of each other and there was such a fun, friendly atmosphere in the class that I actually really enjoyed it! It was interesting to see people’s interpretations of the poems we’d studied and I loved that it really helped to bring poetry to life. People have so many misconceptions about poetry: that it’s boring, pretentious and you’re forced to read it in stuffy classrooms whilst people talk at you and tell you what it’s about and how you’re supposed to interpret it. I found the course at Queen Mary very liberating. It was great to discuss ideas with like-minded people in seminars and the performance week was particularly freeing, allowing us to own our ideas and interpretations in a creative and fun way.